The recession revealed flaws in the supply chains of many companies. The severe drop in demand posed huge challenges for manufacturing companies. Existing problems of the synchronization of supply chains with the needs of the market became evident, and a quick adjustment of the supply chains gained more and more importance during the recession. 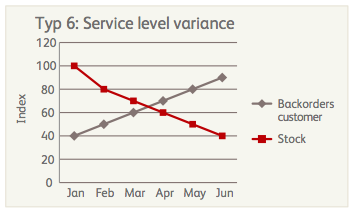 How well did your company react to the drop in demand? Recently, various markets experienced a noticeable upturn and the turnover of many companies has increased. During the upcoming recovery it is crucial that supply chain planning readily adjusts performances – within the supply chains – to market trends, in order to avoid any possible escalations of problems. At the same time, market opportunities must not be missed. Identifying quick wins for IT Support. A fluctuating delivery reliability, despite a steady stock within the supply chain, is an indicator for non-synchronous management of production, and an inflated work in progress (WIP) stock. This results in a slow reduction of the WIP during downturn, and an unsteady supply performance during upturn. 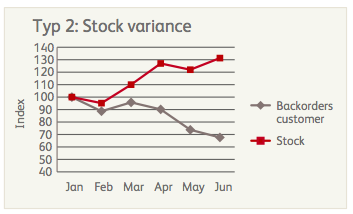 An increasing stock despite an improving delivery reliability suggests that the improvement of the delivery reliability is being “bought” through an overproduction. This is often caused by a non- transparent trend of demand. Synchronized demand management can prevent redundant stock and excessive allocation of capacity. 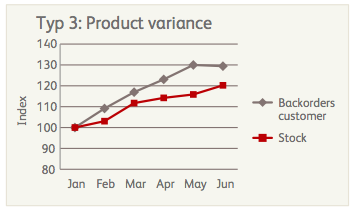 The delivery reliability decreases while the backorder increases, despite an increasing stock. In this case, the necessary products are often not stocked where they are needed on the market. A comprehensive supply chain plan can keep production and stock management synchronized with demand trends in specific markets. Peaks in demand are intercepted by capacity reserves. However, the company systematically has too much or to little capacity, resulting in a cost problem or delivery reliability problem, respectively. A globally transparent capacity management can use buffers more efficiently. The supply chain systematically results in too much stock. Even peaks in demand are compensated by large security reserves. Stock never decreases critically and reserves always remain large. To identify this effect, incoming orders are compared to stock. 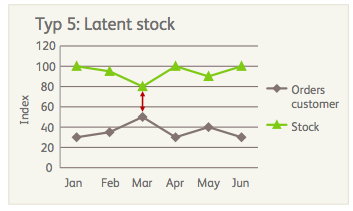 Low stock causes backorders and results in poor delivery performance. ”Stock-out” situations become more and more frequent. Fluctuation in demand is not sufficiently covered by the stock – this issue is the opposite of latent stock, but the corrective approach is the same: stock has to be compared to the expected demand. “Mountains should be low and valleys should be shallow”. This type of variance does not follow the noted principle of the Toyota production system. Attempts to respond to fluctuating demands cause a drastic variation of output. Unbalanced output may cause shortages within the supply chain that limit output at times of high demand. Delivery performance decreases. In addition, the erratic flow of material can result in a bullwhip effect. Non-transparency of real demand on the market causes various demands to escalate within the supply chain. The absence of a comprehensive supply chain organization contributes to this problem. BearingPoint’s approach to a solution is that transparency, market-oriented planning and the introduction of pull principles facilitate effective supply chain management. Every measure taken, therefore, increases synchronization. These three principles can also be seen as stages of an action plan to improve and correct a dysfunctional supply chain management. The first stage of stabilization implies measurements to improve the transparency of the supply chain. Data of customer orders, stock, distribution plans and scheduled arrivals from production and acquisition need to be reportable without delays and determine the level of operative reporting. This should be integrated into a management reporting (e.g. 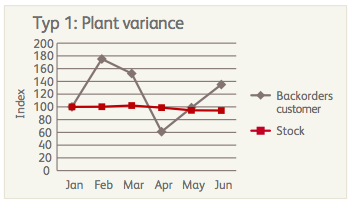 SC-KPI Reporting, “cash-to-cash cycle time” etc.). A suitable reporting approach can partially compensate a lacking system integration within the logistics department. In the medium term, a standardized and integrated process backbone (e.g. a global ERP template) needs to be implemented to lay the foundations for systemic and automated transparency. Measures for market-oriented planning are established in a stage of flexibilization. Optimization of sales planning and the configuration of an interface between the sales department and the supply chain are crucial during this process. The latter is defined by the niveau of exchange of planning data between the sales department and production sites (e.g. products, types of products, etc.) as well as the existence of organizational institutions (e.g. supply chain stewards) that ensure a customer- oriented planning and a comparison of market and supply information. 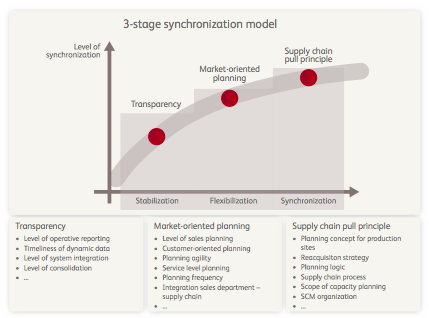 In the stage of synchronization, the desired outcome of agility and flexibility through market-oriented planning is implemented through a supply chain pull. In addition to the introduction of typical pull systems for the processing of orders it is also important to determine how planning information is propagated in the supply chain in advance, in order to facilitate the process of synchronization. These measures have to be supported by a suitable SCM organization. The solution principles of transparency, market-oriented planning and supply chain pull can be successively implemented through a toolbox with different solution components. This toolbox can be broken down into an order management layer, a supply chain synchronization layer and a logistics operations layer. The order management layer comprises of the transfer of requirements into the supply chain, and the methods of checking availability. The operation layer defines internal management approaches, as well as follow-up orders, between the particular parties within the supply chain. The synchronization layer entails those comprehensive planning processes that enforce a rolling co-ordination of particular parties within the supply chain. 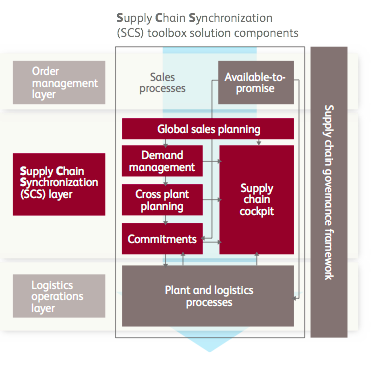 These distinct layers collaborate in an effective approach to synchronize the supply chain and achieve transparency, market-oriented planning and supply chain pull. Global sales planning forms the framework in which to plan anticipated sales. 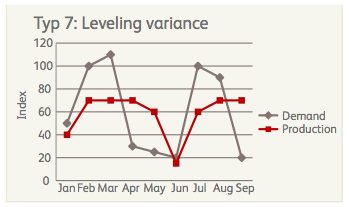 These sales figures can be reflected onto different stages in demand management. Distinct products can be combined into particular types in order to create a production sequence, to start an early acquisition of common parts or to initiate an alignment of certain capacities. The demand management can uncouple the order management layer from the logistics operation layer in order to improve the monitoring and controlling of the flow of demand into the production sites. With the help of cross plant planning, the estimated sales from the global sales plan can be propagated on the level of a single product or on the level of an aggregated capacity. This helps to detect the supply needs of downstream supply chain parties that result from the estimated sales and synchronize these continuously, frequently and comprehensively from the customer to the supplier. It is also possible to set distribution parities and to conduct an availability check against ascertained quotas (commitments) of particular regional companies. A supply chain cockpit ensures transparent key figures from the order management layer (incoming orders), logistics operation layer (stocks, WIP) and synchronization layer (sales plan, commitments, budget figures). A governance framework complements these solution components and manages the interaction between individual organizational units of the supply chain parties and the relations between business units, regional units, head office and regions.